According to data collected by GlobalWebIndex in Q2 this year, Google Maps was the most frequently used mobile app among smartphone users. On top of this surprising statistic, the top ten most frequently used mobile apps shed some interesting – and potentially dubious – facts as well. 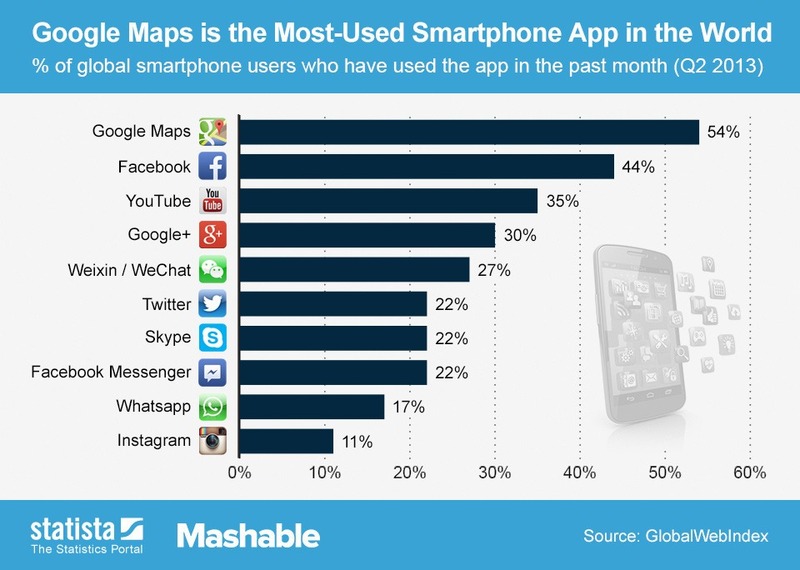 The data indicated that three out of the top four most frequently used apps among smartphone users were Google products: Maps, YouTube and Google+. Facebook, somewhat unsurprisingly, came in second with 44% of the survey participants using the mobile app. Popular instant messaging service Whatsapp finished only ninth, far behind Chinese competitor WeChat who placed fifth. Photo sharing service Instagram rounded the top ten list in the final spot which again is rather surprising. Given that the data was compiled only during one month in the last quarter, the rankings does leave some doubts over the actual app usage. The fact that Google’s services came out on top was unsurprising, but that G+ ranked so high up the list does not quite compute. Either that, or perhaps I’m not mixing with the right crowd.